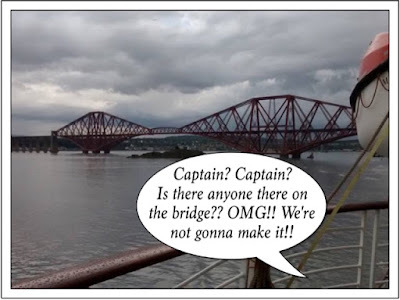 touches of sense...: A bridge too far. The terrible thing about maritime experiential learning is that people may realise at their peril why worse things tend to happen at sea. Unsaved souls may or may not take solace in the fact that thanks to them there are now sufficient life-boats. We think of those at peril on the sea. Learning is limited by interests. Is theoretical learning for those who live on higher land? Reduced ice-berg counts are no compensation for the potentially dire consequences of global warming on countries situated on land lower than sea-level. We think of those at peril from the sea. Bangladesh seems like a long way away. Statistics, damned statistics and lies. Statistics which demonstrate that road accidents may well be more probable than bridge accidents are of little comfort to those unfortunate casualties of 'freak' navigation errors. Costa cruises may still be profitable? Crew from Bangladesh still have safe (badly paid) employment and a better chance than their compatriots of keeping their feet dry. Such secrecy limits victims' learning outcomes and enables easier 'legal' defence. Must the Navy not protect Britain's fishy business? Nelson defeats the French (again). The Forth Bridge still takes too long to paint. Was the Fifth Bridge built in concrete? The Severn Bridge is not spelt wrong. Is learning correct spelling not in the nation's interests? This short shipwreck of a blog was inspired by @nomadwarmachine, @timbuckteeth and @amyburvall. Yes, in the US the turkey never has any reason to assume that life will not just go on, beer and skittles all the way down and Bertie and Jeeves on the telly. Let them eat (binned) cake.